Most people when asked to name a “Catholic” state in the US, think first of Maryland. Maryland has a unique Catholic history among the original 13 colonies. But arguably, New Mexico is the most culturally Catholic state, at least historically. New Mexico celebrates its 100th anniversary of statehood this year. The 47th state joined the Union on January 6, 1912. New Mexico’s European history, of course, traces back to Spain. In 1521, following the defeat of the Aztecs, Spain, established the “vice royalty of New Spain,” which covered much of western North America, south of Canada. All of present-day New Mexico was part of new Spain. In the 1520s and 1530s, explorers Alvar Nunez Cabeza de Vaca and Francisco Alvarez de Coronado for gold in New Mexico. A Franciscan, Marcos de Niza, described the Spanish quest in 1539. Franciscans would play significant roles in the 16th century explorations of New Mexico. These expeditions experienced much hardship and failed to find any gold. For the next 50 years after Coronado, there was little activity in New Mexico. Near the end of the 16th century, the Spanish eventually established a permanent colony in New Mexico. San Juan de los Caballeros was built near the confluence of Chama and Rio Grande rivers. Franciscan missionaries were a large part of this community. San Juan was intended to be the capital of the province of Nuevo México; however, constant conflicts with the indigenous population led the Spanish to move the provincial capital to a location near the Sangre de Cristo Mountains. This new capital, established in 1609, was called Santa Fe. More than 400 years later, it remains the capital of New Mexico. It is the oldest continuously occupied capital in the United States. In the early 1700s, Spanish settlers moved into the Rio Grande Valley and established Albuquerque. 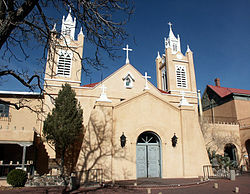 One of the first buildings in Albuquerque was the Church of San Felipe de Neri, on which construction was begun in 1706. The original church was completed in about 1719. This church collapsed in the rainy season of 1792. A new church, which still stands in Old Town Albuquerque today, was built in 1793. 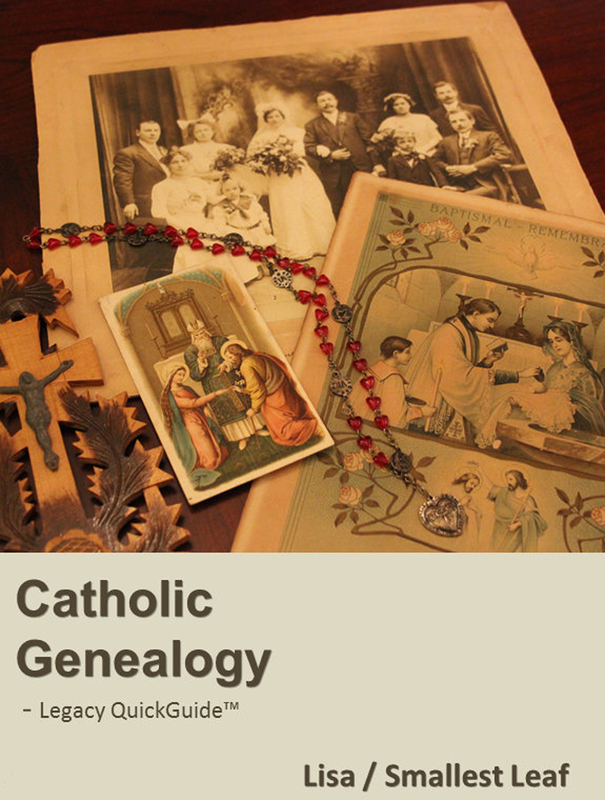 European Catholics who came to New Mexico included not only Spaniards, but Irish and Italian immigrants as well. In 1853, Jean Baptiste Lamy, a native of France, became the first Bishop of the Diocese of Santa Fe. 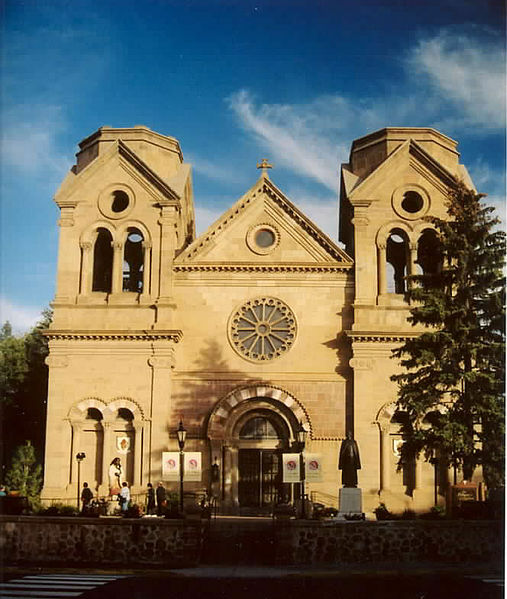 In 1875, Lamy was consecrated the first Archbishop of the Archdiocese of Santa Fe. 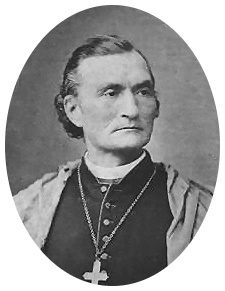 Jean Baptiste Lamy (1814-1888), first Bishop of Santa Fe. Willa Cather’s novel, Death Comes for the Archbishop, is based on his life. Lamy was a legendary churchman who did much to improve the administration of the Church in the American West. Part of his great influence was due to the sheer size of the Santa Fe see. Since 1875, parts of the Archdiocese of Santa Fe have been spun off into the Vicariates of Arizona and Colorado, and the Dioceses of Dallas, El Paso, Las Cruces, and Gallup. Although the culture and history of New Mexico are inextricably tied to the Catholic Church, modern demographic trends have caught up with the Land of Enchantment. Only 26% of the population identifies as Catholic according to the United States Religious Landscape Survey (2007), conducted by the Pew Foundation Forum on Religion and Public Life. That’s only slightly more than the U.S. nationwide figure of 24% Catholic. These figures represent a significant change from the 1920s, for example. The 1920 federal census found 360,350 inhabitants in New Mexico, while the federal Census of Religious Bodies in 1926 counted 215,553 Catholics. The figures work out to roughly 6 out of 10 New Mexicans as Catholics in the 1920s. What happened? Much has to do with changes in Latino demographics over the years. Whereas the Latino population of New Mexico once was predictably overwhelming Catholic, as in Latino populations elsewhere there has been tremendous growth in Protestant Evangelicals among Latinos in New Mexico. The 2007 Pew survey found the total percentage of Protestant Evangelicals in New Mexico to be about 25%, nearly equal to the percentage of Catholics. Approximately 20% of Hispanics in New Mexico are said to be Protestant Evangelicals. My Catholic family moved to New Mexico in 1961, several months before the 50th anniversary of statehood. We attended Mass at the two chapels located within the boundaries of the semi-secret Sandia Base, then the nation’s premier atomic weapons installation, located on Albuquerque’s southeast side. Our pastors were chaplains from all of the military services. We attended public schools in Albuquerque, although a lot of our friends went to Catholic schools, especially Holy Ghost School in the southeast quadrant. Because we didn’t go to Catholic school, we had to attend catechism classes every week. These were taught by nuns of the order of Sisters of Charity, augmented by lay teachers from the community. Several years later, catechism classes were moved to Sunday mornings at 7:30 before the nine o’clock Mass in the New Chapel. There was a CYO (Catholic Youth Organization) chapter on the base. CYO was much fun. We had hayrides and dances, went ice-skating, and to the movies. We got to know other Catholic young people through CYO. My brothers and I became altar boys during our time in New Mexico. We made great friends like Mike Stark, Frank LoCasio, and others, and had memorable experiences (no, the time I got sick on the altar during the 5:00 a.m. sunrise Mass one Easter doesn’t count! ).